In August and September, when the tomatoes are abundant, we gorge ourselves on this Summer Tomato Salad because we know that the time for eating it at its best is finite. The salad epitomizes the best things of summer – the warmth of the sun, the sweet acidity of vine-ripened tomatoes, the crunch of sweet Vidalia onions, and the licorice taste of basil – all swimming in a perfectly balanced vinaigrette. This simple recipe comes with a storied history. In 1965 Adrienne decided she wanted to take cooking lessons in France. Not knowing how to go about finding a teacher, she picked up the phone and called Craig Claiborne, the food critic for the New York Times (whom she did not know at the time), to ask for a recommendation. He gave her Julia Child’s number. Yes, that Julia Child. Unfortunately, Julia was living in the States at the time, but she recommended one of her co-authors of Mastering the Art of French Cooking, Simone (Simca) Beck. Simca had homes in Provence near Cannes and in Paris where she had a cooking school. She taught Adrienne the basics of French cooking and culture and they became good friends. One sunny afternoon Adrienne invited Simca to a poolside lunch at a house they were renting in Mougin, France. She served a fresh summer tomato salad as the first course. Simca proceeded to remove the skin from each slice of tomato with her knife and fork before she ate them. “The skins are not appealing and the tomato absorbs the vinaigrette better without them.” She explained that the easiest way to remove the tomato skins before preparing the salad was to quickly blanch them in hot water and peel the skins away. To this day it is how we prepare the tomatoes for the salad. If you love this recipe please consider supporting the Food For Thought campaign to build awareness for the dementia that has stolen Adrienne’s ability to communicate or cook. In this recipe the measurements for the oil and vinegar are not given and what you end up with may not align with the classic 3:1 ratio for a vinaigrette. This is because the dressing will be influenced by the sweetness and acidity of the tomatoes. So each time you must taste, taste, taste to get the balance correct. You should use the best-quality vinegar and olive oil here because their taste will shine against the tomatoes. Step 1 Bring a large pot of water to the boil. Half fill a large bowl with cold water. Make a small “X” in the skin of each tomato at the end opposite to the stem (where there is a small black dot or sometimes a series of irregular round black bumps). This will help the skin to peel off easily. Blanch 3 or 4 tomatoes in the boiling water for 3 to 5 minutes. You will see the skin crack and peel. Remove immediately and place in the cold water. Repeat with remaining tomatoes. Step 2 With a paring knife, peel the skin off the tomatoes and remove the stem and any white pith. Slice the tomatoes horizontally approximately ½ inch thick and layer them in a wide shallow serving bowl. Sprinkle each layer with balsamic and sherry vinegar, oil, some of the onion, and salt. Step 3 When you have all the tomatoes sliced, taste the liquid in the bowl for the oil/vinegar sweet/acid balance. Add more sherry vinegar and olive oil, as well as salt and pepper, as necessary. Unlike most salads, the dressing should pool in the bottom of the bowl. You should have about ½ cup of dressing in the bowl by the time you serve the salad. Taste again. If you are not sure about the balance, let the salad sit for 10 minutes to allow the juices of the tomatoes and the onions to blend with the oil and vinegar. Taste again for seasoning. Step 4 Chiffonade (chop or cut with scissors into fine strips) the basil and sprinkle on the salad just before serving. If you chop the basil before making the salad it will get discolored, so wait until just before serving. I find scissors are easier than a knife: Remove the leaves from each branch and stack them into piles. Fold the pile of leaves in half along the spine and, starting at the tip, scissor them into thin strips. Step 6 Spoon some of the dressing from the bowl onto a slice of semolina bread, add a slice of buffalo mozzarella, then smother it with the tomatoes and more dressing and get ready for nirvana! I tried this recipe several times and had wanted to provide my gratitude here now finally got time! I love this recipe as it is delicious and very quick to make. Last month, we had a holiday with our Parisian friends in Tuscany, Italy and I gathered the courage to make this dish for all of us. (Believe me, making a dish for my food Parisian friends does require courage). Thanks Minji and glad to hear your Parisian friends were impressed – that is a difficult feat!! 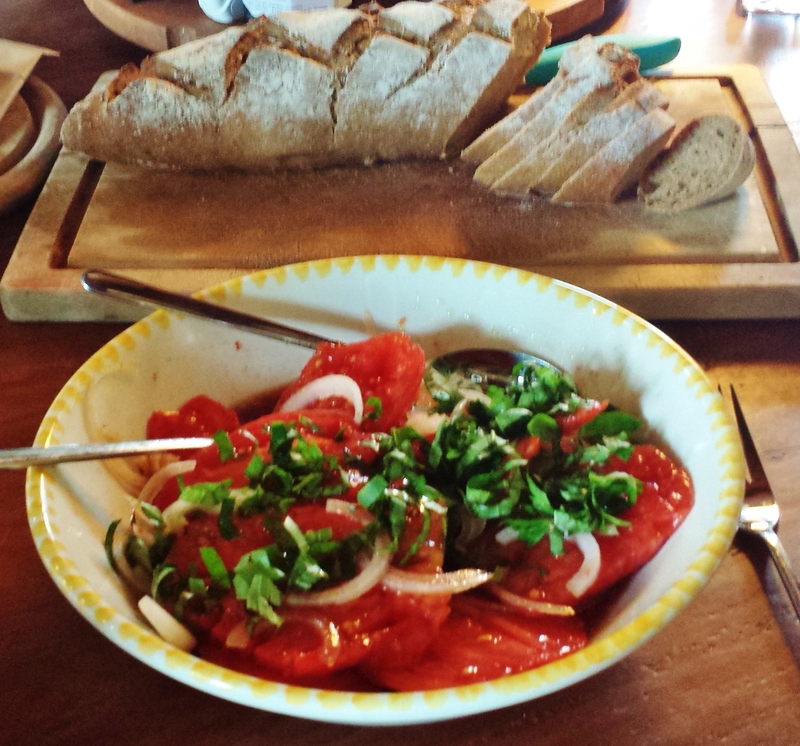 The tomatoes in Tuscany must have been fabulous in September!